Posted by Tantumblogo in awesomeness, Basics, catachesis, episcopate, General Catholic, Glory, Grace, Latin Mass, Liturgy, Restoration, the struggle for the Church, Tradition, true leadership, Virtue. Everyone else has done a post on this, I guess I may as well, too. Actually, given the superlatives I’ve seen lauded on this sermon, I was a trifle disappointed. It was very good, especially from a prelate in this age of the Church, and something that is very much appreciated, but I guess my expectations had been built up to the point that I thought I was going to get a Wolfe-ian or Rodriguezesque full throated takedown of the Novus Ordo, but that’s not quite what this was. Still, it was very good. We’ve known Archbishop Sample has been a strong supporter of the TLM for years, but he makes clear here that he sees the liturgical revolution – or the revolution against the authentic Liturgy – as a serious mistake and something from which the Church must pull back and, in essence, recover. He also vociferously argues that the TLM is not the domain of an aging, nostalgic remnant but is strongly, one might even say overwhelmingly, the province of the young. Which, good to note, the revolutionaries love their pat responses and easy misrepresentations, so the truth has to be repeated over and over to counter those. I also see basically no ways in which the Novus Ordo might enrich the TLM – I know this might be a harsh or extreme view, but having read a fair amount about how the propers have been butchered and even corrupted and the 3 year cycle of readings almost totally divorced from the ancient (and one might say, inspired) flow of the liturgical year, I don’t think it an unsupportable assertion. That’s not to say that the Novus Ordo is always a disaster or a danger to one’s faith – there are Greenville’s and Hanceville’s and other locales where the Novus Ordo is offered in ways vastly superior to the standard offering in 99% of parishes, but those are all cases where the Novus Ordo was “enriched” by the traditional Mass, rather confirming the fact that “mutual enrichment” is a dead letter, a red herring, and quite likely a grave danger to be avoided. The enrichment must run in one direction only. Posted by Tantumblogo in awesomeness, Basics, Dallas Diocese, episcopate, General Catholic, Glory, Grace, Latin Mass, North Deanery, Restoration, the struggle for the Church, Tradition, true leadership, Virtue. From a reader in Tyler, we are informed that Bishop Joseph Strickland of the Diocese of Tyler, Texas is “learning” the Traditional Latin Mass and will assist (it is believed, in choir) at a TLM to be offered by diocesan priests at the Chapel of Saints Peter and Paul on the Feast of Corpus Christi (Thursday, May 31). It is always a happy development when a bishop indicates interest in, and appreciation for, the unadulterated, un-modernized Mass. It means that the bishop has a sense of the importance of reverence for God and recognizes the undeniable centrality of Jesus Christ, and His Sacrifice on our behalf, in the ancient form of the Mass. It also usually means that bishop is of a predominately orthodox outlook in matters beyond the liturgy, as well. It’s not a guarantee of doctrinal orthodoxy on all matters, but it’s a darn good sign. Tyler, a remote and small diocese, most of which could easily be considered mission territory due to the paucity of Catholics (even after decades of hispanic immigration into Texas), has been blessed with some relatively orthodox bishops for years. Good on them. Perhaps one of those bishops might be promoted to head the Diocese of Dallas someday? On that front, some well placed birdies who would know have strongly hinted there will probably be a TLM in the northern deanery of the Dallas Diocese in the not too distant future. Nothing is confirmed, yet, but there is a pastor or two who are willing and there are no impediments from the chancery, which is a big change from the previous administration. So there is likely to be at least a weekday TLM alternative for all those folks in Collin County before too long. Don’t take that to the bank, but it’s more likely than not, from what I am told. Timing and location still TBD at this point. Thanks to reader JB for sending in the bit about Bishop Strickland. 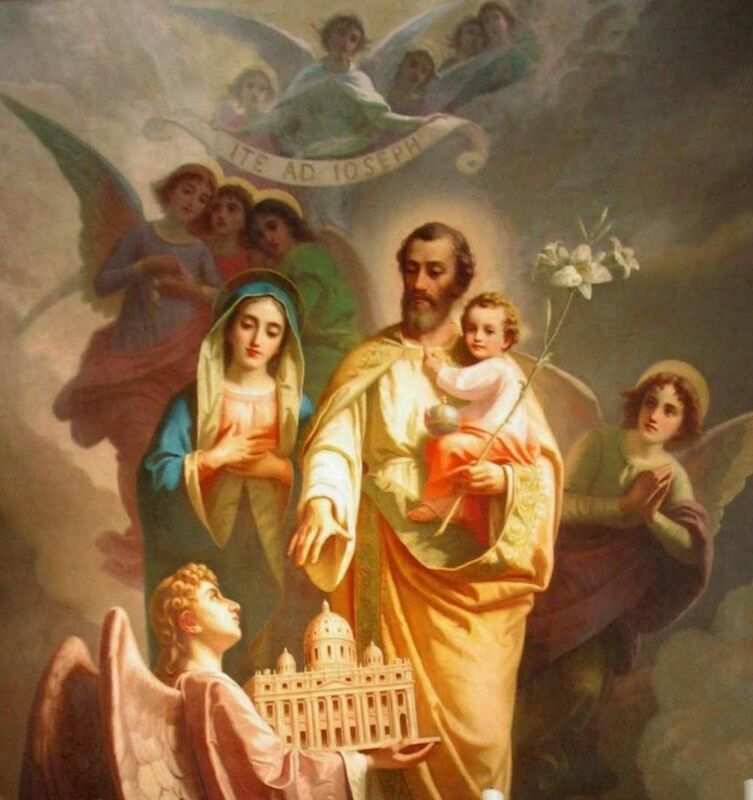 Posted by Tantumblogo in awesomeness, Basics, catachesis, Christendom, Domestic Church, family, General Catholic, Glory, Good St. Joseph, Grace, Interior Life, Saints, Tradition, true leadership, Virtue. I try to read at least one book on Good St. Joseph every year, and this year I found a very good one at the Our Lady’s Army Conference in DFW last month. It’s The Divine Favors Granted to St. Joseph by Pere Binet. It’s a very nice little book, containing more than just the usual history of devotion to St. Joseph or his small role in Scripture, but it is an extended examination of the divine favors he received as revealed through the revelations to various other Saints and the thoughts of many Church Fathers on the subject. 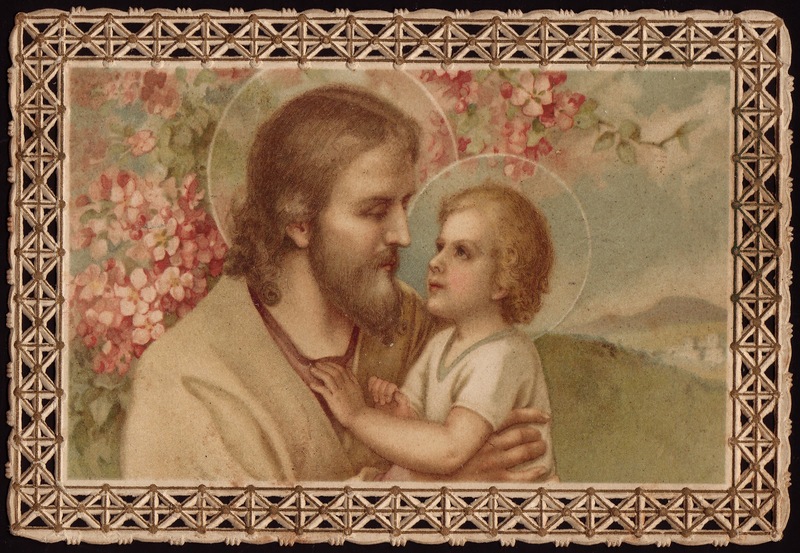 The book closes with a series of prayers to St. Joseph, some of which were new to me, at least, and I felt several of them deserved to be shared with a wider audience. I will repeat again, as I always do when mentioning St. Joseph, my full concurrence with the great Saint and Doctor Teresa of Avila, that St. Joseph is an unbelievably powerful intercessor and helper to souls in need (which, of course, is all of us), and is unwaveringly loyal in seeing our requests through to fruition, provided they are in accord with God’s Will. Just last night and today I had direct evidence of St. Joseph’s total effectiveness as an intercessor. He’s especially helpful for husbands and fathers, but he helps all souls, of course. He and Our Lady should be our first recourse when we have particular needs to offer up to Our Blessed Lord. 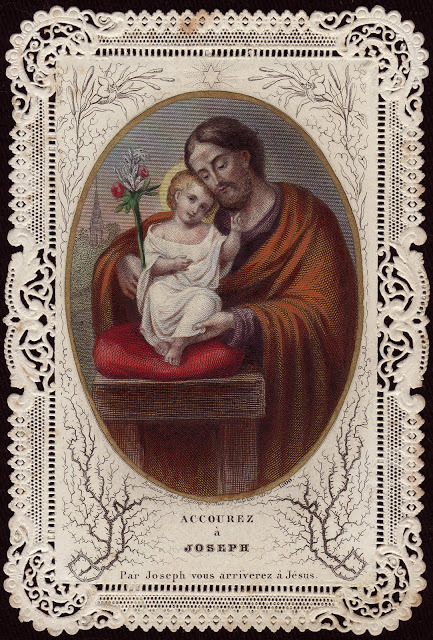 To thee, Blessed Joseph, do we have recourse in our tribulation, and having implored the help of thy thrice-holy Spouse, we confidently invoke thy patronage also. By that charity wherewith thou wast united to the Immaculate Virgin Mother of God, and by that fatherly affection with which thou didst embrace the Child Jesus, we beseech thee and we humbly pray, that thou wouldst look graciously upon the inheritance which Jesus Christ hath purchased by His Blood, and assist us in our needs by thy power and strength. Most watchful guardian of the Holy Family, protect the chosen people of Jesus Christ; keep far from us, most loving father, all blight of error and corruption; mercifully assist us from Heaven, most mighty defender, in his our conflict with the powers of darkness; and, even as of old thou didst rescue the Child Jesus from the snares of the enemy and from all adversity; keep us one and all under thy continual protection, that, supported by thine example and thine assistance, we may be enabled to lead a holy life, die a happy death, and come at least ot the possession of everlasting blessedness in Heaven. Amen. Next, a Prayer for the Triumph of the Church. I can think of few prayers more needed in this time. O glorious St. Joseph, chosen by God to be the foster-father of Jesus, the chaste spouse of Mary ever Virgin, and the head of the Holy Family, and then appointed by the Vicar of Christ to be the heavenly patron and defender of the Church founded by Jesus, most confidently do I implore thee at this moment thy powerful aid for all the Church Militant on earth. Do thou shield with thy truly paternal love especially the Supreme Pontiff and all the bishops and priests who are in union with the Holy See of Peter from all error, stain of corruption, and deviation from the Truth of Jesus Christ. Be the defender of all who labor for souls amidst the trials and tribulations of this life, and cause all the peoples of the earth to submit themselves in a docile spirit to that Church which is the sole ark of salvation for all men. 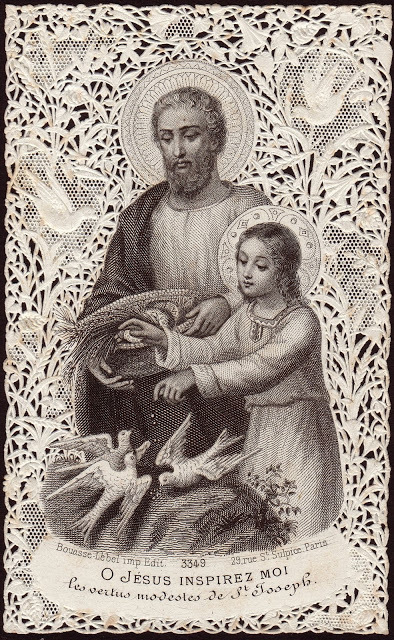 Be pleased also, dear St. Joseph, to accept this dedication of myself which I now make unto thee. I dedicate myself wholly to thee, that thou mayest ever be my father, my patron and may guide in the way of salvation. Obtain for me great purity of heart and a fervent devotion to the interior life. Grant that, following thine example, I may direct all my actions to the greater glory of God, in union with the Sacred Heart of Jesus and the Immaculate Heart of Mary and in union with thee. Finally, pray for me, that I may be a partaker in the peace and joy which were thine at the hour of thy holy death. Amen. 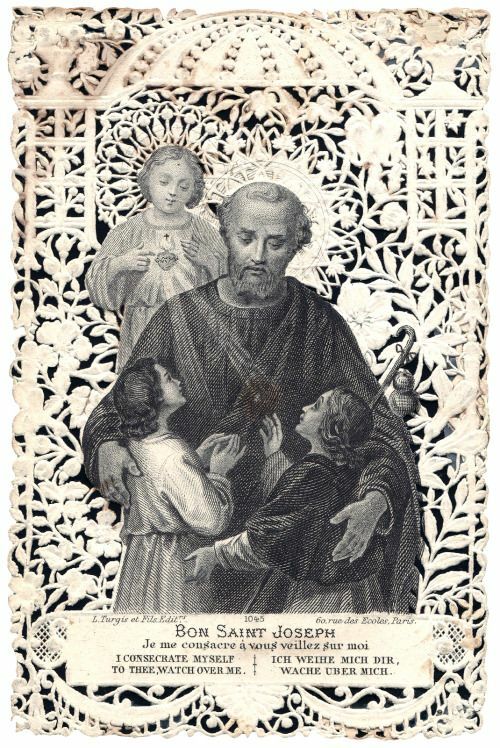 O glorious St. Joseph, behold I choose thee today for my special patron in life and at the hour of my death. Preserve and increase in me the spirit of prayer and fervor in the service of God. Remove far from me every kind of sin; obtain for me that my death may not come upon me unawares, but that I may have time to confess my sins sacramentally and have access to all the aids Holy Mother Church makes available to souls departing this life. May I bewail all my sins with a most perfect understanding and a most sincere contrition, in order htat I may breathe forth my soul into the hands of Jesus and Mary. Amen. Saint Joseph, father and guardian of virgins, into whose faithful keeping were entrusted Innocence Itself, Christ Jesus, and Mary, the Virgin of virgins and sinless Mother of God, I pray and beseech thee, through Jesus and Mary, those pledges so dear to thee, to intercede for me that I may be kept from all uncleanness, and to grant that my mind may be untainted, my heart pure and my body chaste; help me always to serve Jesus and Mary in perfect chastity. Amen. I pray you find these prayers useful! As for me, I plan to make the Prayer for the Triumph of the Church a daily prayer of mine. It’s not about what’s good for the earthly glory of the Church, but what is good for souls. Posted by Tantumblogo in Art and Architecture, awesomeness, Basics, catachesis, Christendom, Ecumenism, General Catholic, Glory, Grace, history, Latin Mass, sanctity, the struggle for the Church, Tradition, Virtue. I’ve found a “new” channel on Youtube called Holy Faith TV. It’s not that new, it’s been around almost a year, but it’s new to me. And here is a video from what was then a mainstream educational film company on the jubilee year of 1950. Can you imagine Scholastic doing a reverential and respectful video on the Church today? How much, and how much for the worse, our society has changed since then. “…….here lies a spiritual power that no godless philosophy may hope to vanquish.” Take it to heart, leftists! It’s not all from the 50s. There is content dating at least back to Saint Pius X. 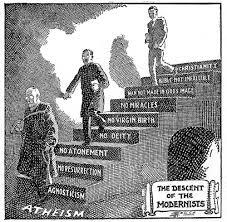 And some of it is more modern commentary, from a wide diversity of sources, from people known well to this blog like Fr. Michael Rodriguez and Bishop Athanasius Schneider, to more esoteric sources. I can’t say I’ve watched much of the commentary, but as for the historical stuff, I love it. So much more like that! Apparently Youtube contains just part of the content, there is a website that ostensibly has more but I haven’t really had time to check it out. Perhaps you will, and if you do, feel free to share anything of interest you may find! As always, of course my happiness at finding this channel is not necessarily an endorsement of everything on it. But I think there is quite a bit good to find there. Posted by Tantumblogo in awesomeness, Basics, Bible, catachesis, General Catholic, Glory, Grace, Interior Life, reading, sanctity, Spiritual Warfare, Tradition, Virtue. I’ve been reading – slowly – The Great Commentary by Cornelius a’ Lapide, in the Loreto Press version with the introduction by none other than Charles Coulombe. It’s an excellent if exhaustive biblical commentary. I can see why it is so often used by traditional priests – there are insights to Scripture I’ve never seen anywhere else, though a few are dated (like the medical references to the latest 16th century medicine). Nevertheless, it’s an excellent if expensive biblical commentary. I strongly recommend it. As I said, it’s an exhaustive commentary, a’ Lapide does not manage to cover all of St. Matthew’s Gospel in a single 600 page volume (not including a ~130 page introduction). In fact, he doesn’t even make it halfway. Sometimes it does get a bit draggy into really minute detail. Overall, however, it’s the best Catholic biblical commentary available in English, at least until someone finishes translating Bellarmine, which hopefully Ryan Grant is working on (Mediatrix Press, by the way, has a 10% off sale for Lent. It’s a good time to save). Fittingly are the meek conjoined to the poor in spirit, because the poor and lowly are wont to be meek, as vice versa, the rich and the proud are often impatient and quarrelsome. Poverty and meekness are neighbors, and related virtues………For “the meek,” says Chromatius, are “those who are gentle, humble, modest, simple in faith, patient under all injury, who set themselves to follow the precepts of the Gospel and imitate the Lord’s example of meekness. Therefore, the meek are those who rule over impatience, anger, envy, vengefulness, and other disturbances and troubled movements of the soul, and do not murmur against God when He permits adversity, nor become indignant at injuries caused by neighbors, nor seek revenge upon those who harm them, but bear all things placidly in God’s providence, who orders all these things to His glory and for their salvation, when they practice resignation and acquiesce in them. This is why the meek, by the sweetness of their manners, reconcile to themselves the souls of all. Christ alludes to what David says in Psalm xxxvi:11, The meek shall inherit the land, and shall delight in abundance of peace. Meekness, therefore, makes us 1. pleasing to God and men 2. like Christ, Who says, Learn of Me, because I am meek, and humble in heart (Matt xi:29), 3. apt for wisdom and gaining celestial goods. For capable of receiving these is the heart which is meek, placid, and tranquil, as Psalm xxiv:9 says: He will guide the mild in judgment: He will teach the meek His ways. Finally, Climacus gives the reason, indeed several reasons, why the meek are blessed when he says: “Meekness is the helpmate of obedience, the leader of religious community, a curb to those who steal, a power that expels the wrathful, the teacher of joy, the imitator of Christ, the property of the heavenly, fetters and bonds of demons, a shield against bitterness and harshness of spirit. The Lord rests in the hearts of the meek. The turbulent soul is the nest of the devil. The meek shall inherit the earth, or better, shall rule the lands, while the furious shall be driven our out of their lands………. [This last bit is not entirely related, but it was so good i had to include it]……..Moses promised earthly goods to the Jews, but Christ promised heavenly goods to Christians. I think that’s it for today. I’m sure enjoying a Lapide – I only wish I had more time to read, to soak up this glorious Faith of ours, which always seems, providentially, to provide an answer to one’s yearnings, even if those yearnings were unrecognized. Sometimes you don’t know what you need, or what really hurts, until God shows it to you. May He be forever praised! Posted by Tantumblogo in awesomeness, Basics, Dallas Diocese, Father Rodriguez, fun, General Catholic, Glory, Grace, Interior Life, priests, Restoration, sanctity, Spiritual Warfare, Tradition, Virtue. Come see Michael Matt, Fr. Isaac Relyea, Fr. Michael Rodriguez, Fr. 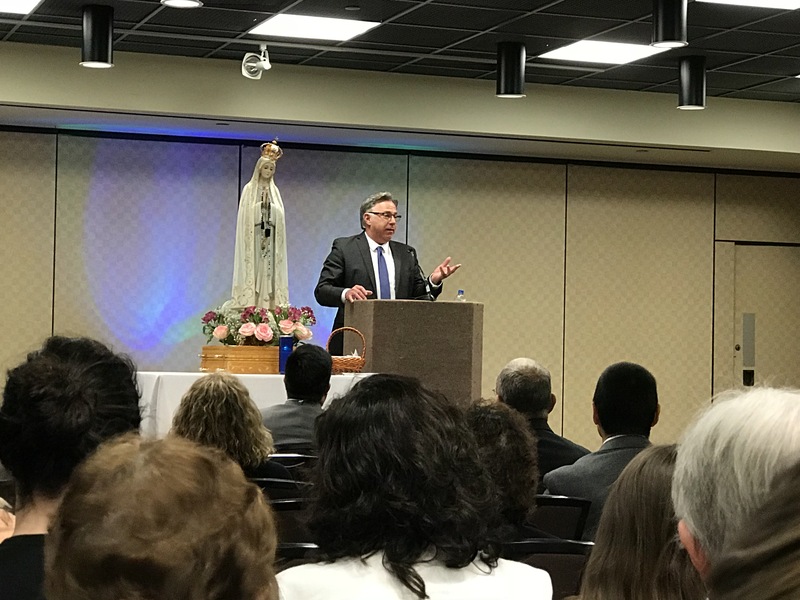 Paul MacDonald, Chris Ferrara, David Rodriguez and many other top flight Catholic speakers at the 2018 Fatima Conference at the DFW Airport Hyatt on March 9-11!! I should be there both Saturday and Sunday and look forward to seeing YOU! BTW, a helpful hint from David Rodriguez, while daily attendance is $20 per person per day, a very reasonable rate for such top-flight Catholic content, airport parking can run a similar rate per car per day BUT just take your parking ticket inside the hotel to the front desk, tell them you are there for the conference and they will validate your ticket so that parking is free! So you can save perhaps $30-$50 depending on how much you attend (and live locally/are not staying at the Hyatt), money you can spend on the fantastic Catholic books, video, and other resources that will be available for sale at the conference. I already know a good number of people attending this conference. If you see a long tall (and kinda fat) Texan with boots and chaw in his mouth come by and say hi to Tantumblogo! I really hope to meet Michael Matt and Fr. Relyea and say hello. I understand these conferences can be really great not only for their Catholic content but for the socializing and friendships that can be made. You can pay your $20 entrance fee at the door or buy tickets at the link above if you are so inclined. I pray I see many good readers there! Dominus vobiscum! Posted by Tantumblogo in awesomeness, Basics, catachesis, Dallas Diocese, family, Father Rodriguez, General Catholic, Glory, Grace, Interior Life, Latin Mass, manhood, Restoration, sanctity, Tradition, true leadership, Virtue. I apologize to Father Rodriguez for the delay in getting this posted. It’s been one of those weeks. I am just hurriedly putting up a couple of items that have been pending for days and which it will soon be too late to post. I asked Father Rodriguez to give an exhortation to souls to attend the upcoming Fatima Conference at the DFW airport Hyatt on March 9-11. I already know quite a few people who plan on attending, but there is room for many, many more. If you live local, you should absolutely attend, and if you are at some distance, why not take a nice Lenten retreat with the spouse and get some solid Catholic catechesis from top-rank sources? At any rate, here is Fathers exhortation. I also add some more video updates on the conference below. Father, of course, will be giving multiple talks at the conference, along with such well known masters of Catholic catechetics as Fr. Paul MacDonald, Chris Ferrara, Michael Matt, and David Rodriguez. My name is Fr. Michael Rodríguez, and I am a priest of the Diocese of El Paso, Texas. I want to urge all Catholics of the Dallas-Ft. Worth area, of Texas, and beyond, to make every effort to attend the upcoming Fatima Conference, “The Battle for Marriage and the Family,” on March 9-11, 2018, at the Hyatt Regency, DFW International Airport. On Ash Wednesday, we heard God’s call to conversion through the Prophet Joel, “Be converted to me with all your heart, in fasting and in weeping and in mourning. And rend your hearts and not your garments, and turn to the Lord your God.” (2:12-13) At its core, this too is the urgent message of Our Lady of Fatima, specific for our times, the 20th and now 21st centuries! There is a rapidly growing crisis in true Catholic Church teaching on Marriage and the Family! There is currently an extreme crisis in the Papacy itself! In many ways, our Catholic Church and Faith is being shaken to its very foundations! If the one true Church of Jesus Christ is in extreme crisis, then necessarily the salvation of all souls is at risk!  How am I turning away from sin and turning to God?  How am I being faithful to true Catholic worship and doctrine?  How am I helping others to be faithful to true Catholic worship and doctrine?  How am I witnessing to and defending true Catholic Church teaching on Marriage and the Family?  Am I heeding Our Lady’s Message at Fatima for the salvation of souls? The upcoming Fatima Conference will help you respond to the above in a way that is faithful to God and our holy religion. Set aside some time for God and our Blessed Mother, and come! The most holy Mother of God came to Fatima, Portugal, in 1917, to provide the magnificent light of her Son, our Savior Jesus Christ, specifically for our times of extreme spiritual darkness. Last year was the Centennial Anniversary of her Apparitions at Fatima, and still, her message goes largely unheeded by the world’s Catholics. This is a providential opportunity for you to take a first step and respond to God, Our Lady, and the Church. Once again, please make every effort to come to the Fatima Conference, March 9-11, 2018, and invite as many other Catholics as you can! Posted by Tantumblogo in awesomeness, Basics, Dallas Diocese, Francis, General Catholic, Glory, Grace, history, Latin Mass, Liturgy, Restoration, sanctity, Tradition, true leadership, Virtue. I am happy about this permission given to the Priestly Fraternity of St. Peter, to offer the Holy Week and Easter rites according to the 1945 Missal, thus not including the revolutionary changes to the Mass introduced by Pius XII. Even though many traditional Catholics have relatively little problem with the changes Pius performed, it must be made clear that it was these “relatively innocuous” changes that established a precedent for what before had always been seen as out of bounds – making inorganic changes to the structure of the Mass. Without the Holy Week, or “Easter Rite” changes, there would have been no Novus Ordo, no mutilation of the ancient canon, probably in use since apostolic times or shortly thereafter, and its replacement by modernist fabrications, to paraphrase Pope Benedict. So Francis of Rome has given permission to go back to the old rite before the revolution against the Liturgy began, but not, it seems, to the SSPX. Which is actually kind of revealing – the fact that they have not been given this permission argues that they are an organic part of the Church, and being governed similar to other organizations, while not being given this permission may have much to do with internal SSPX politics, where there has long existed some division over whether Archbishop Lefebvre made the right call in settling on the 1962 Missal as the standard for the Society, rather than an earlier, unadulterated version. I have no real opinion on these matters, save that I very much prefer the 1945 Missal and personally use one. I also like to hear the Good Friday prayer that calls the Jews, even the perfidious ones, to conversion. The information was published in several of the Fraternity’s US-parish bulletins. Each church of the Fraternity has to request permission from the superiors before taking advantage of the indult. According to rumours, 25 parishes have been granted permission so far. However, on Good Friday, the prayer for the Jews published by Pope Benedict XVI must be used. So it’s not an entire return to the ancient order – Benedict’s highly unfortunate capitulation to worldly opinion will still be used. So, I’ll just have to read the old style prayer myself again. I do not know if the local FSSP parish has requested permission to use the pre-1958 Mass.